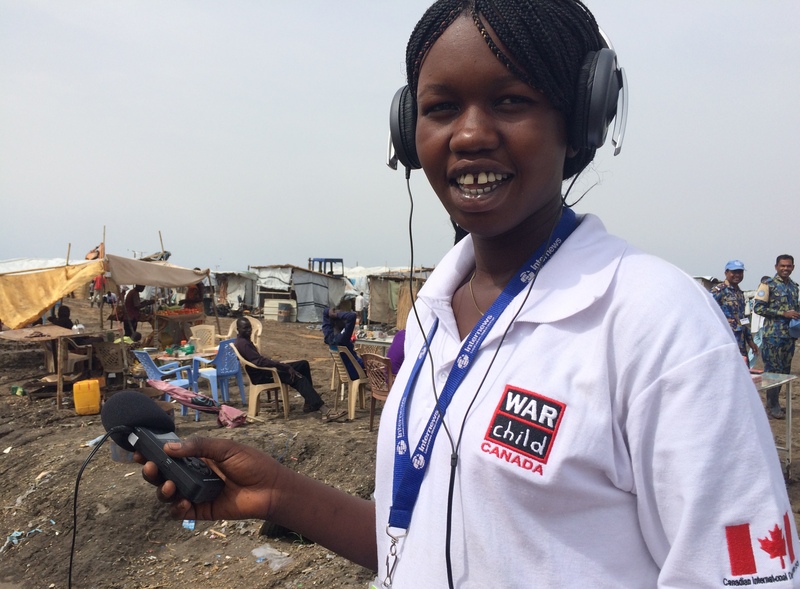 Julia Paulo Ding reporting for Nile FM in Malakal’s Protection of Civilians site. MALAKAL, South Sudan – As the sun rises and a new day begins, Julia Paulo Ding gets ready for work in the two-and-a-half-by-four meter blue and white tent she shares with her older sister’s family. They all — three adults and three children — live together in a displaced peoples’ camp on the outskirts of Malakal, Upper Nile state, in South Sudan. Ding, 22, places an Internews identification badge around her neck, then shoves a small audio recorder, headphones, pen and notebook into her backpack. She quickly leaves her temporary home in the United Nations Protection of Civilians (UN POC) site. South Sudan’s 16-month-long civil conflict has devastated the world’s youngest nation, and has shown few signs of resolution since its eruption in December 2013. Even today, an astonishing 1.5 million people are estimated to have been displaced across the country. Ding is a Shilluk, the third most prominent ethnic group in the region, following the Dinka and Nuer groups. The Shilluk people have lived on the banks of the White Nile, a tributary of the Nile River, for centuries. In the current conflict, which has often split along tribal lines, Upper Nile state, where Ding lives, has become a flashpoint for ethnic rivalries in South Sudan. Ding reaches the main gate of the UN Mission in South Sudan’s “humanitarian hub.” Flashing her ID badge, she’s allowed to enter. She has spent much of the last year working with Internews, learning how to produce humanitarian information audio programs. 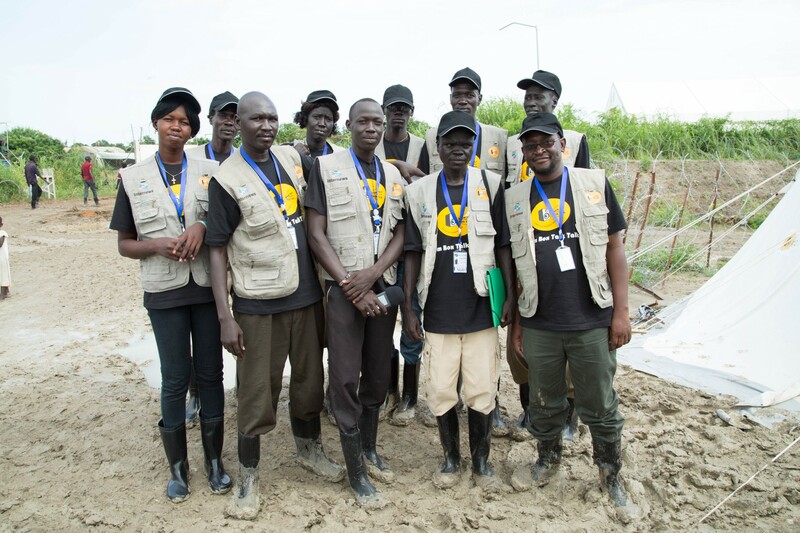 The Boom Box Talk Talk team provided a critical humanitarian information service to Internally Displaced People in South Sudan’s much contested Upper Nile State. Now, they’ve launched a radio station. The Malakal Boom Box Talk Talk team. Courtesy of Jean-Luc Dushime. Internews’ humanitarian information service, Boom Box Talk Talk, or BBTT as it is widely known, became an instant hit with people living in the POC site when it launched last July. It was a practical but innovative information solution in a place where the only previous radio station had been destroyed during the conflict, making information a scarce commodity. BBTT journalists produced a news program, then played it at designated stops within the POC site via boom boxes. Listeners learned about critical aid distribution and other news, all while going about their daily routines. Boom Box Talk Talk soon became a two-way communication platform, as those living in the POC could share their concerns with the BBTT correspondents who would then inform the aid agencies and provide answers to community questions. Now, the enormous success of the Malakal team’s efforts has allowed a new radio station to be set-up on the UNMISS base. Nile FM began broadcasting in March 2015, and extends critical information into the community beyond the barbed wire fence and UN-protected perimeter. Thousands of displaced people in camps and settlements along the Nile are now able to access vital information on humanitarian services — as well as much-welcomed music and community news. 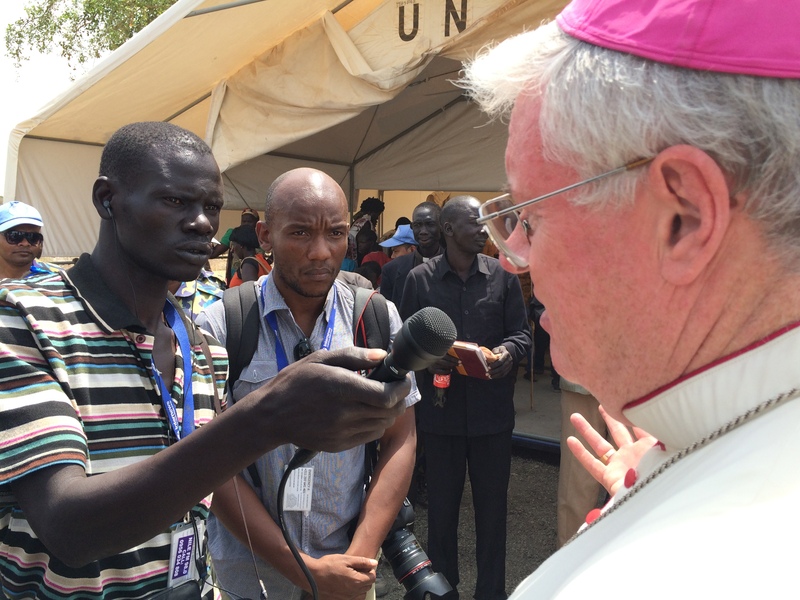 A Nile FM reporter interviews the Vatican’s Papal Nuncio, on a visit to Malakal UN base. Nile FM is putting the community back into community radio. Ding exits the Nile FM studio booth to join her colleagues at the daily news meeting. Paulino Sebit, 23, is Nile FM’s news editor. He leads a meeting where all of Internews’ 11 community correspondents — a mixture of Shilluk, Nuer and Dinka — are present. It’s a multilingual team for a multilingual radio station. The Internews team in Malakal has produced some of the most informative and educational radio programs during the conflict in South Sudan. All of the correspondents live in the POC site and work there everyday, reporting on its residents’ daily activities to restore some semblance of their former lives. Chanjwok Simon, 20, is the youngest reporter and newest member of the team at Nile FM. He was away from his family when the conflict broke out on December 15, 2013. By the time the fighting reached Malakal nine days later, he was already safe at the UNMISS base. The news meeting concludes and Ding shakes everyone’s hand before leaving.